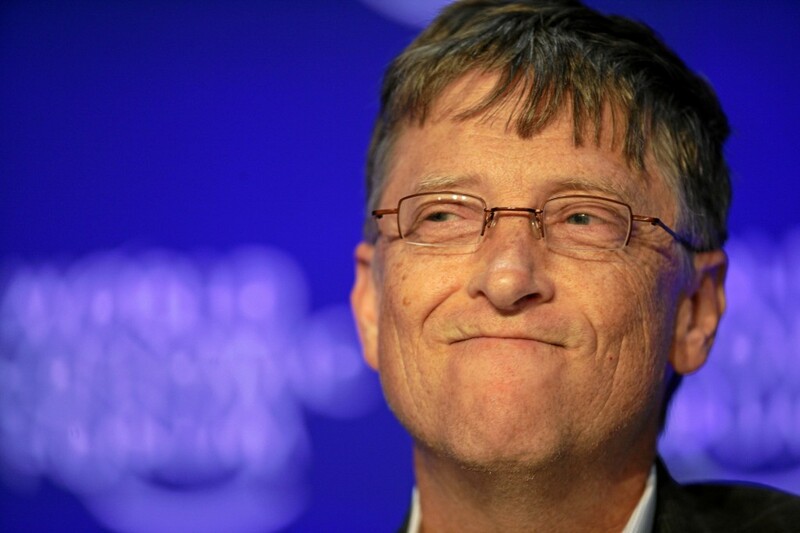 Editor’s Note: Bill Gates is now absurdly promising to eradicate poverty in two decades. This is typical American evasionism, like US counterinsurgency theories that claim to want to win the hearts and minds of people while conveniently ignoring the social matrix of rebellion—institutionalized oppression and poverty— and subjecting the people to harsh repression, imposed tyrannies, wholesale occupation, and gross exploitation. The great fount of poverty and inequality is global capitalism, and it will not cure itself, even if Gates were sincere about wanting to fix its toxicity. In fact, the US government alone, which represents the consensus of the American and world plutocracy, spends trillions of dollars a year maintaining the very system of inequality that Gates is now supposedly aiming to dislodge. On the eve of the annual spectacle of parasitic wealth and power that is the World Economic Forum in the Alpine resort town of Davos, Switzerland, the Oxfam charity has issued a report warning of the unprecedented growth of social inequality throughout the world. The report includes a chart showing that since 2008, the United States has had the largest increase in social inequality of any developed country. The impoverishment of the working class on the one side and further enrichment of the financial elite on the other have accelerated since the Wall Street crash of that year. While the wealth of the world’s billionaires has doubled, there are today over 1 billion people living on less than a dollar per day, and nearly half the world’s population, more than 3 billion people, subsist on less than $2.50 per day. The same day Oxfam issued its study, the International Labor Organization reported that the number of unemployed people worldwide grew by 5 million in 2013, to 202 million. The ILO predicted that the ranks of the unemployed would continue to rise in 2014. There is no parallel in human history to the immense concentration of wealth that exists today, nor to the extremes of parasitism and decadence that constitute the “new normal.” Contemporary capitalism—what the ruling class and its political and media flunkies call the “free enterprise system”—has created a world in which every policy decision is dictated by the need to protect and increase the wealth of an infinitesimal portion of the world’s population. This global plutocracy—by definition, a society governed by the wealthy—generates a huge and ever-increasing portion of the ruling elite’s wealth not from the production of useful products and expansion of society’s productive capacities, but from the manipulation of money, speculation and outright swindling—essentially criminal activities that are destructive of the productive forces. This social—or, to be more precise, anti-social—element is virulently hostile to the people, contemptuous of democratic rights, and militaristic. In its effort to expand its personal wealth, it relentlessly attacks the living standards of the working class—the vast majority of the population. All over the world, governments controlled by the plutocrats impose ever more painful austerity, cutting wages, slashing jobs, dismantling social programs, closing schools, gutting health care. State treasuries are emptied to provide bailouts to the banks and corporations and central banks pump trillions into the financial markets to drive up stock prices, corporate profits and CEO pay. All legal restrictions on profit-making are lifted. To deal with the opposition of the workers, governments are systematically criminalizing organized resistance by the working class. In countries across Europe, every significant strike is met with legal bans and police violence. Petrified at the prospect of social revolution, they are putting in place the infrastructure of a global totalitarian police state, as revealed by the revelations of former National Security Agency contractor Edward Snowden. Competing cliques of plutocrats, using their national states as bases of operation, invade weaker countries and occupy and plunder them without mercy, inflicting death and destruction. In the struggle against their rivals for control of territories, markets, resources and cheap labor, they turn the planet into an armed camp and threaten to plunge mankind into a third world war, this time with the prospect of nuclear annihilation. The rich and the super-rich will be on display this week at Davos, the yearly event at which government officials and leaders of global agencies such as the United Nations, the European Union, the World Bank and the International Monetary Fund come to pay obeisance to billionaire bankers and corporate CEOs. The global financial elite is preparing, in the words of one commentator, “to jet to the World Economic Forum 5,000 feet up in the Swiss Alps in their helicopters, mink-clad trophy wives in tow.” The cost of attending the conference, estimated by CNN at around $40,000 per person, is about 50 percent greater than what a typical worker in the US makes in a year. This conference has announced that the “problem” of social inequality will be a central topic of discussion. The masses all over the world are becoming increasingly outraged over this criminal layer, which they hate and despise. It is only a matter of time before that anger is transformed into action. The moneyed elite is haunted by the specter of social upheaval and revolution. They received a taste of it three years ago in the mass working class uprising that brought down the Mubarak dictatorship in Egypt. They have seen social explosions in Europe and anticipations of coming upheavals in the United States. That they have been able to hold onto power is above all due to the treachery of the trade union bureaucracies, aided by their apologists in the right-wing organizations that call themselves “left,” such as the International Socialist Organization in the United States, the New Anti-capitalist Party in France, the Left Party in Germany, and Syriza in Greece. The more perceptive and far-sighted defenders of the capitalist system are warning that the present situation is unsustainable. Last week, the Financial Times ’ chief economic commentator Martin Wolf penned a comment entitled, “Failing elites threaten our future,” in which he warned of the growing threat of social revolution. Since the financial breakdown of 2008, he wrote, the “economic, financial, intellectual and political elites” have discredited themselves. “If elites continue to fail,” he concluded, “we will go on watching the rise of angry populists. The elites need to do better. If they do not, rage may overwhelm us all.” The people of the world are confronted with the question: What is to be done with this anti-social and criminal layer that is strangling the planet? Nothing can be changed by appealing to the “better angels” of the plutocracy, as Oxfam would do. Nor by appealing to the elite’s rational faculties, as Wolf seeks to do. As a matter of social hygiene and basic survival, the wealth of this parasitic layer must be expropriated. The working class, organized as an independent political force, must seize it and use it to meet crying social needs—jobs, health care, education, housing, nutrition, access to culture and art. The death-grip of the plutocrats over finance and industry must be broken. The banks and corporations must be taken out of private hands and placed under public ownership and democratic control. There is only one way this can be done: by means of the revolutionary transformation of society and the establishment of socialism. Andre Damon and Barry Grey are senior members of the Social Equality Party (SEP), publisher of wsws.org. Posted in AMERICAN BRAINWASH, CAPITALISM & SOCIALISM, CONSERVATIVE + RIGHTWING, CULTURAL POLITICAL ISSUES, INEQUALITY, PLUTOCRATIC POWER, THE AMERICAN WAY OF LIFE.